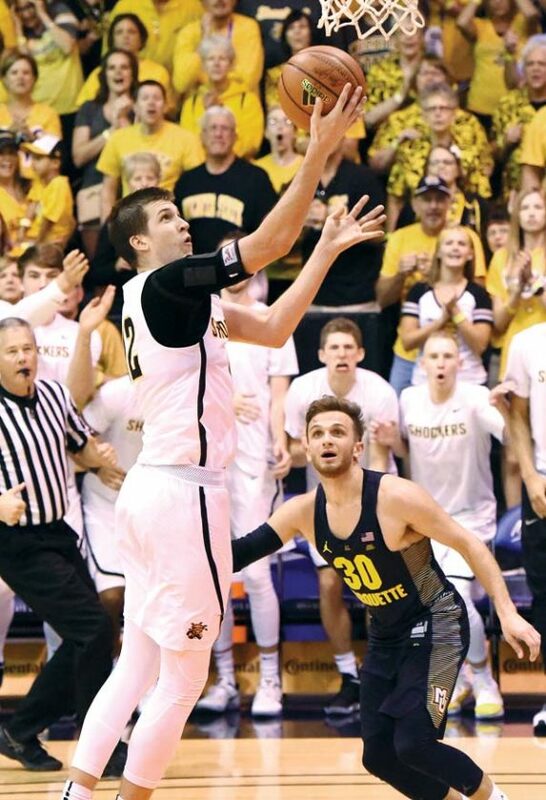 LAHAINA — Wichita State’s balanced effort withstood Marquette’s one-two punch. 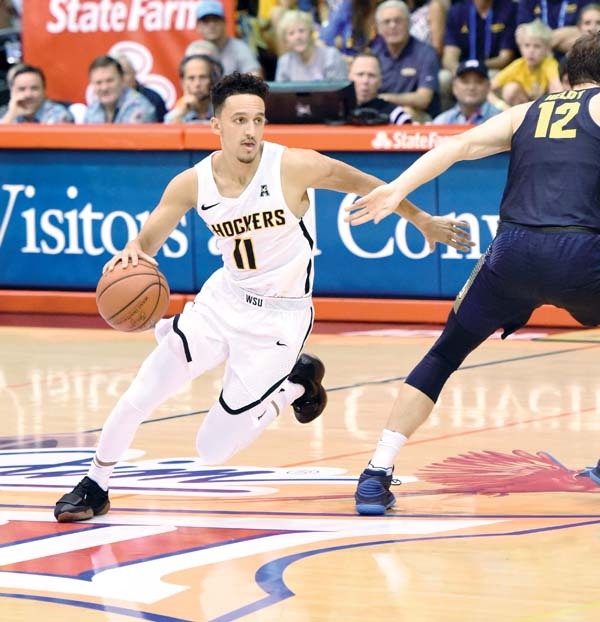 Landry Shamet scored 19 points for the Shockers, who had three other players also reach double digits and got at least one field goal from every player who took the floor in an 80-66 win over Marquette on Tuesday at the Lahaina Civic Center, earning a spot in the Maui Jim Maui Invitational championship game. Wichita State (4-0), No. 6 in The Associated Press poll, will face 13th-ranked Notre Dame today in the title game. 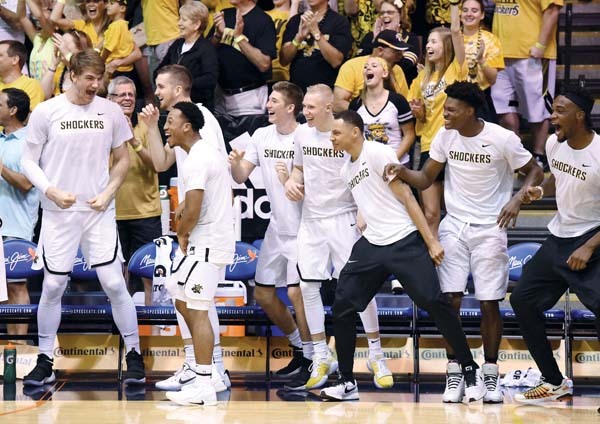 A day after rallying from 18 points down to beat California in the first round, the Shockers got another tough test — they were tied with the Golden Eagles (2-2) with less than 15 minutes left in the game. Wichita State players and fans celebrate in the second half. 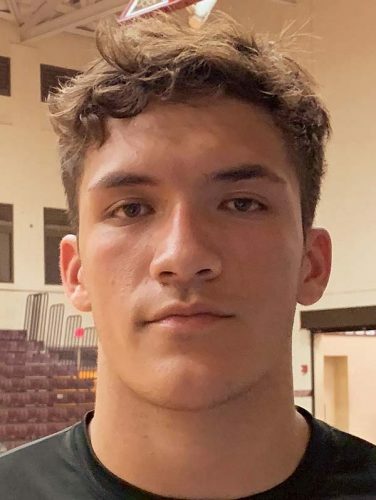 Conner Frankamp scored 13 points for the Shockers, Shaquille Morris had 11 and Austin Reaves finished with 10. Andrew Rowsey scored 26 points for the Golden Eagles and Markus Howard added 25, but none of their teammates had more than five. Rowsey’s one-handed shot in the lane 3 1/2 minutes into the second half tied the game at 45, but Wichita State then went on a 13-3 run. Shamet scored 10 points in the final four minutes. 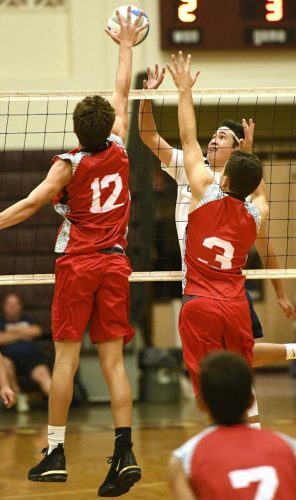 Marquette’s Sam Hauser played 22 minutes while dealing with foul trouble, and finished with three points. 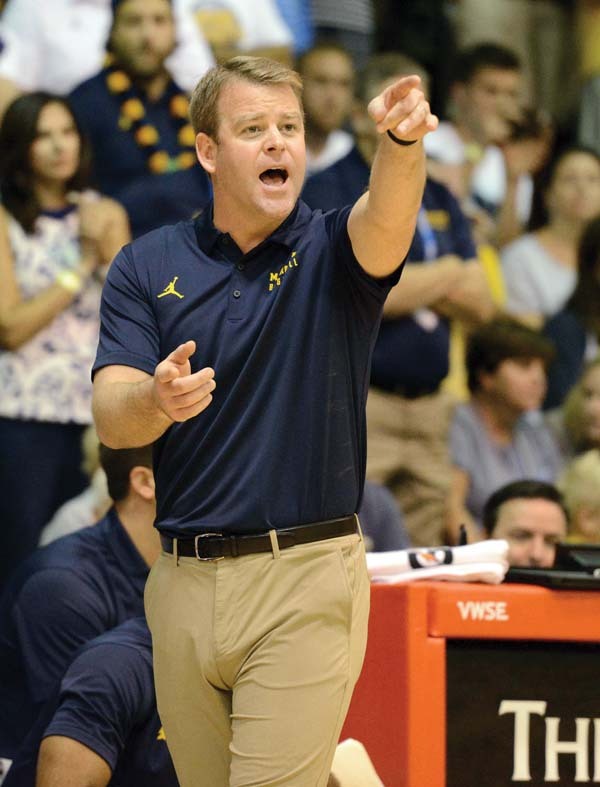 Marquette coach Steve Wojciechowski shouts to his team. Heldt 0-0 2-2 2, Rowsey 9-22 4-5 26, Cheatham 2-6 0-0 5, Howard 9-18 4-4 25, Hauser 1-5 0-0 3, Cain 1-5 0-0 2, John 0-0 1-2 1, Elliott 0-0 0-0 0, Anim 1-5 0-2 2. 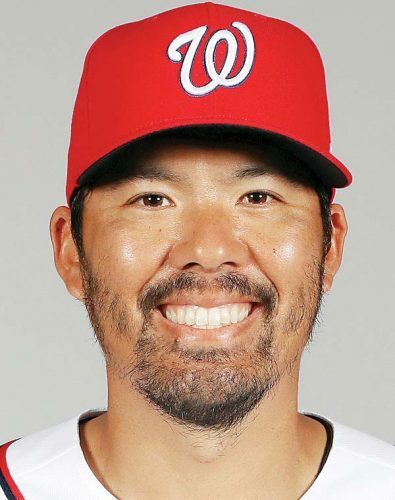 Totals 23-61 11-15 66. The Shockers’ Austin Reaves goes up for a layup in front of the Golden Eagles’ Andrew Rowsey. Z.Brown 1-3 0-0 3, Kelly 2-4 2-3 6, Morris 3-10 5-6 11, Frankamp 5-10 0-0 13, Shamet 7-12 4-4 19, Willis 4-6 1-4 9, Nurger 3-3 0-0 7, Haynes-Jones 1-2 0-0 2, Reaves 5-7 0-0 10. Totals 31-57 12-17 80. Halftime–Wichita St. 41-36. 3-Point Goals–Marquette 9-33 (Rowsey 4-12, Howard 3-10, Cheatham 1-2, Hauser 1-4, Anim 0-2, Cain 0-3), Wichita St. 6-19 (Frankamp 3-7, Nurger 1-1, Z.Brown 1-3, Shamet 1-4, Haynes-Jones 0-1, Reaves 0-1, Morris 0-2). Fouled Out–None. Rebounds–Marquette 22 (Heldt 6), Wichita St. 41 (Kelly 10). Assists–Marquette 9 (Anim 3), Wichita St. 18 (Kelly 8). Total Fouls–Marquette 19, Wichita St. 17. A–2,400 (2,400).